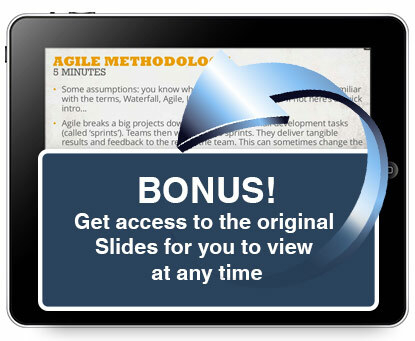 Save yourself $60 and view GALA’s popular 50 minute Agile Project Management Webinar absolutely FREE! If you are one of the thousands of members of the Globalization and Localization Association (GALA) chances are you have seen Richard Brooks’ (CEO of K International) webinar on Agile Project Management. It was their most popular presentation in June & to celebrate they are offering it up to non-members for FREE!! !… normally this would cost non-members $60, Offer extended until the 30th of November due to popular demand!!! so don’t waste any time and start finding out how Agile Project Management could benefit your business. Looking at agile it’s worth taking it back to the Agile manifesto…. Just enter your Name and Email Address and we will send you the link to the webinar along with a promotional code. As a special bonus we will also send you a link to the original slides so you can view the information when ever you like.